Home networking giant Linksys chose a luxury suite in the Bellagio Hotel (made famous by George Clooney in Ocean's 11) to show off the latest and most polished version of its KiSS range of home media streamers. 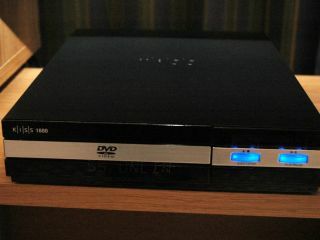 A simple set-top box, the KiSS device hasn't included a Blu-ray or HD-DVD drive in order to earn it's HD status. Instead it uses the arguably more sensible strategy of combining a DivX decoder with its DVD player, and Universal Plug & Play (UPnP) compatibility for pulling high definition movies from any compatible devices on your home network. New to the KiSS 1600 is a menu feature that connects to an on-demand video service. This is hosted by Linksys but features a familiar list of content partners such as CinemaNow and Reuters. A built-in pre-N specification wireless adaptor completes the package, making the proprietary device competitive against other platform technologies being espoused by Intel and Microsoft. The KiSS 1600 will be available in Europe by May, although pricing is yet to be confirmed. The CEO of Linksys' parent company Cisco, John Chambers, also demoed a concept design for a new torque shaped controller which will be introduced as part of the KiSS range by Christmas 2007. Featuring an internal gyroscope similar to the celebrated Nintendo Wii wand, owners will be able access on screen menus by waving at the TV to move a cursor around. Along with its new media streamers, Linksys is also demonstrating its latest range of pre-N networking kit, including the WRT350 router, which boasts a USB port for adding hard drive network storage, and the WRT600 5GHz dual band wireless router. A new £100 wireless print server, the WPSM54G, claims to be the first of its kind capable of supporting multi-function printers for scanning and faxing over the network.